Eat your heart out, Anomalisa. 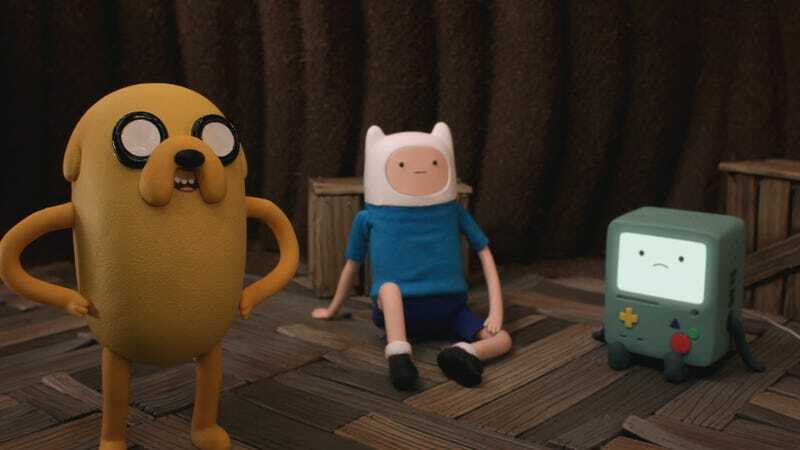 Adventure Time is doing its first ever stop-motion-animated episode, as part of a whole week of episodes starting next Monday. PLUS there’s a new Ice King episode! Monday, January 11: “Angel Face”– BMO ropes his friends into a live action cowboy role-playing adventure! Tuesday, January 12: “President Porpoise Is Missing!” – Finn and Jake must find President Porpoise before Vice President Blowfish takes over! It’s chaos under the sea! Wednesday, January 13: “Blank Eyed Girl” – One very spooky night, Finn and Jake come face-to-face with an urban myth. Friday, January 15: “A King’s Ransom”– Ice King suffers a heartbreaking loss and it’s up to Finn and Jake to find the culprit. Chaos under the sea, and cowboy role-playing also sound quite promising.